-- Qatna-Mishirfeh, a famous site, has not been looted. Maqdissi says this is because it is too famous and people would know, but he also notes that "in contrast to other sites, Qatna-Mishirfeh is still being guarded." --the majority of looters are professionals working in gangs that learned their trade in Iraq. -- UNESCO has been training the staff of the General Directorate of Antiquities and Museums but not the activist groups engaged directly in trying to protect sites and museums. Traditionally, the guards are paid by the Syrian government and by foreign archaeological missions, which usually brought the money into the country themselves. For more than three years now, foreigners have stayed away. I have tried to help by picking up the money personally at foreign institutions and sending it from Lebanon to trustworthy Syrians, who gave it to the Directorate of Antiquities so that the guards' wages can be paid for another year. But that only helped a small number of the guards. According to my estimates, 30 to 40 per cent of them no longer receive any money. The sites of the ancient trading city of Mari-Tell Hariri, for example, are currently being guarded by overburdened villagers. It would be interesting to take a look at UNESCO's budget to see how much has been spent on its international meetings and on conservation training, and to ask how many sites would have been saved from looters had the funds instead gone to pay site guards' salaries. But that's an academic question, since as Maqdissi says, UNESCO's bureaucracy is very entrenched -- including, notably, the experts whose expertise is not in guarding but in conserving -- , making it almost impossible to redirect resources. And one can see why paying for site guards might open a can of worms for UNESCO. The World Heritage Fund's annual assistance budget for the entire world is only $4 million, and while Syria's situation is perhaps the most desperate, there are many, many countries lacking the money to pay for enough site guards. So where is the money to come from? One answer, laid out by Mounir Bouchenaki in his contribution to Antiquities Under Siege, might be actually funding the Intergovernmental Fund for the Protection of Cultural Property in Times of Conflict, established but (to my knowledge) never actually contributed to by any state party. Don't hold your breath on that happening any time soon. 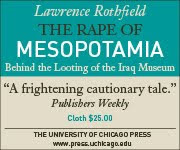 It would take leadership from the US, which sends John Kerry to talk loftily at the Metropolitan Museum about the need to do something to stop the looting of sites in Syria but whose policy moves have been limited to helping document the damage. There are, to be sure, other funding sources in the world aside from governments and foreign archaeological missions. One could imagine, for instance, the antiquities dealers associations, museum directors' associations, and a phalanx of ultra-wealthy enlightened collectors, all led perhaps by James Cuno, coming together to set up their own fund. Or, better still, lobbying the governments of major collecting nations to set up funds and generate the revenues to go into those funds via a tax on antiquities sales. Zahi Hawass calls for Egypt's Antiquities Law to be amended to provide for harsher punishment for antiquities crimes, arguing that this will deter looters. But the law, according to the article, already calls for a minimum three year sentence. Would ratcheting that sentence up to five or more years make any difference? That depends. As Gary Becker and Michel Foucault in their very different ways have both noted, deterrence only works if three things are all true: the risk of being caught is substantial; punishment is severe and certain enough to induce fear; and criminals know the risks of being caught and the price they would pay. The key point for Egypt, presumably is that if the risk of being caught continues to be low, then making an already substantial penalty more severe is not going to change the calculations of looters. We have evidence for this from 1990s Iraq. Saddam introduced the death penalty for looting after the US established no-fly zones that made it impossible to effectively police the archaeological sites and looting soared. Even though ten looters were beheaded on national television, the Draconian penalties did little to slow down the looting. The European collectors who are buying these artifacts illicit will over the long haul undoubtedly either sell them onto the international market or donate them to museums like the Met, for future exhibitions like this one. So Kaylan doesn't have it quite right. What is most endangered is not the small number of museum-worthy antiquities like those displayed at the Met. ISIS is implementing a regulated "licit" market in areas under its control, and permitting the international export of artifacts -- a kind of parodic realization of the market structure advocates from the collecting community drawing on John Merryman's work have called for. Those artifacts are safe. What is endangered, rather is the context of the sites out of which they will be snatched or chiseled, and the knowledge of the past that this context holds.